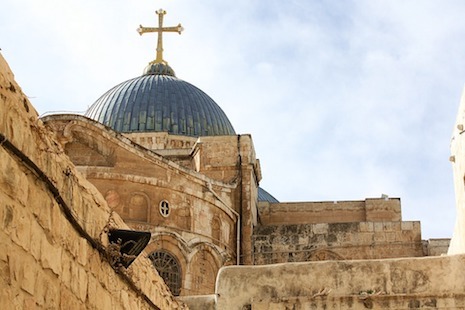 The decision to temporarily close the Church of the Holy Sepulcher in Jerusalem was the local Christian community’s cry for help, according to the prior of Dormition Abbey, the Benedictine monastery that sits on Mount Zion just outside the city’s ancient walls. But Father Nikodemus Schnabel OSB, who also serves as spokesman for the Benedictines in Jerusalem, says the deeper reason behind the unprecedented action to close Christianity’s holiest site was to preserve the vision and nature of Jerusalem as a holy place for all believers. “The question is do we want Jerusalem to be a holy city for Jews, Christians and Muslims?” the 39-year-old monk told Domradio.de. “There are increasing signs that there are forces in Jerusalem that do not share this vision. Certain groups clearly and openly proclaim that Israel belongs to the Jews and that all non-Jews should leave,” the German-born monk said. “I can therefore fully understand that church leaders rightly thought that the moment had come to send out an alarm signal,” he added. The heads of the various Christian communities that share custody of the Church of the Holy Sepulcher shuttered the popular shrine last Feb. 25 to protest an Israeli government tax plan that targeted Christian-owned properties. They re-opened the place revered as the site of Jesus Christ’s crucifixion on Feb. 28 after the Israelis scrapped the proposal. Father Schnabel said it was more important than ever for all religions to shoulder their responsibility for promoting peace as spiritual arguments were “all of a sudden” being used to veil the real aim of political conflicts. He noted that the three monotheistic religions are very much alive in Jerusalem and play an important part in caring for pilgrims from all over the world, as well as providing education, social and charity work for local residents. But the Benedictine priest lamented that the United States’ current administration, intent on presenting itself as Christian, continues to describe the State of Israel as a paradise for Christians. He acknowledged that Islamist terrorists don’t cut people’s throats in Israel as in Syria and Iraq, but he said the Israeli authorities are increasingly “lethargic” when it comes to protecting Christians and guarding church buildings. Father Schnabel was asked if Christians were taking the rap for President Trump’s decision to move the US embassy from Tel Aviv to Jerusalem. “No, it’s the other way round,” he said. The priest said Christians in Israel do not want Mike Pence or Donald Trump to speak up for them, but want to get their voice back and speak for themselves. “They’ve been here for centuries and want to describe what challenges they face as a tiny minority of 2 percent,” he added. Father Schnable said there are no easy answers for Jerusalem, but recalled that the Holy See had for decades held on to what he firmly believed was a visionary solution. “The old town really is a corpus seperatum, a separate entity, which should be internationalized. Its ownership should not be narrowed down to a purely nationalistic issue,” he said. In a separate interview with Deutsche Welle (DW), the Benedictine said religions should be careful not be drawn into choosing sides in political conflicts. “We religions must not allow ourselves to be pocketed. We are a counterpart to politics. One cannot literally derive a concrete policy from Holy Scripture texts – be it from the Quran, the Talmud or, most especially, the Bible. They are not simple instruction manuals. If you take them literally that is equivalent to violating the Holy Scriptures,” said Father Schnabel. He noted that Trump used a religious line of argument to justify moving the US embassy to Jerusalem, thereby sparking a global controversy and inflaming tensions in the Middle East. You may access this article below.